All rise, indeed! To say that Aaron Judge cards took the hobby by storm would be an understatement. The hoopla surrounding Judge's emergence is best compared to a collecting hurricane with the massive ballplayer still smacking bombs from the eye. Amplified by the bright lights of New York City and the iconic Yankees franchise, Aaron Judge baseball cards may have exploded in value but the supply is anything but limited. Starting with his first licensed cards in 2013 sets, collectors have multiple years to pick between but these earliest examples are among the most popular. This includes the 2013 Bowman Chrome Draft autograph (and parallels), which remains the card to beat. Shop for high-end Aaron Judge cards on eBay. However, the slugger's baseball cards have continued to roll out steadily since then, including a full assortment of Aaron Judge rookie cards, which came in 2017 products. As more sets release over time, expect to see plenty of new Judge cards to track down. That's where this Aaron Judge hot list comes into play. Because there are so many choices already, we get right to the cream of the crop with a real-time guide to his most-watched eBay card listings at auction. Not confined to one season or period of his career, you can expect to see the cards driving the most excitement and interest online, at any given moment. It's also a good place to spot the more elusive options, like the various one-of-one cards or low-numbered parallels. Although these rare cards may be too steep for most budgets, they are still fun to look at and enjoy, even from afar. Below is a list of the 50 most-watched Aaron Judge card listings currently at auction on eBay. Click on the individual listings to review further details or make your offer. Follow this link to see the current Aaron Judge auctions with the most bids. 2019 TOPPS HERITAGE AARON JUDGE RED INK AUTO NUMBERED 22/70!!!!!! 2017 BOWMAN #32 AARON JUDGE YANKEES PSA 10 . 2017 Topps Chrome Update AARON JUDGE GOLD AUTO 47/50 HMT50 Beckett 9.5 GEM MINT! wow wish i had them all!!! look on. CHEERS!!!!!!!!!!!!!! 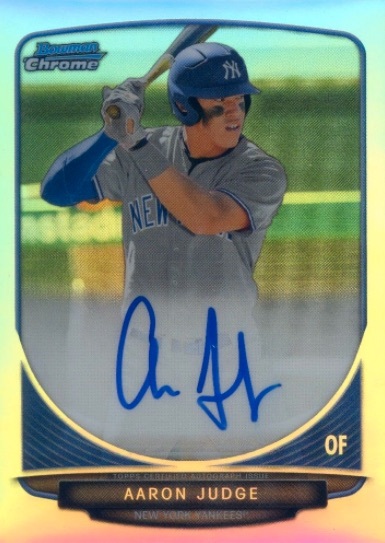 OK, i have another one for ya…I just got an Aaron Judge card-Topps series 1 card #193. I believe its a parallel card ?? On the back of the card, in gold numbers, it says 27/50. Anywhere I look i see #D/2018…however mine says 27/50 in gold…any ideas..? It’s a parallel. I’m guessing it’s either the Mother’s Day Pink or the Father’s Day Blue. You should be able to tell based on the background color. 2013 Bowman Chrome Aaron Judge RC Rookie Signed AUTO Yankees PSA 9 10 Pop 7!